Ruby's Hotel "Our Belize Vacation" - "Our Belize Vacation"
In June of 1978, Ruby's Hotel opened for business. Romel and Ester Gomez are the owners of Ruby's Hotel. Along with their three children- Ester ("Vidy"), Ruby, and Nesto - they lived on the beach front next to the hotel. 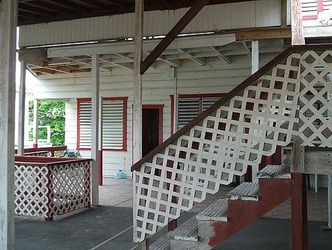 The original Ruby's Hotel was made up of four rooms. According to "Vidy," the business has always been a family business and will always be. "When the hotel first opened we got most of our business from the British soldiers. They brought us a lot of business. We still have many of our first customers visit us every year, except those that have passed away," she said. The primary success of the business is due to solely "word of mouth." In time the Gomez family learned about the value of advertising and had brochures and business cards made to publicize their hotel. Today, the majority of advertising is done on the Internet. "We get a lot of our bookings through the net," she said. 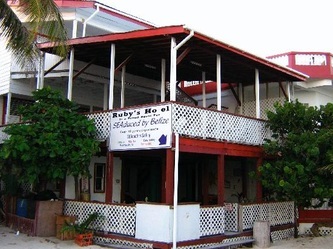 Ruby's Hotel is now made up of 21 rooms, a cafe, and a fishing and snorkeling shop. You can be sure to get the best in clean, comfortable, budget accomodations. Come visit and be a part of the "Ruby's Family". Join the countless traveler's that keep coming back year after year for a great time at Ruby's!To make a reservation I will need a credit card number with expiration date. One night will be charged on the room and is non-refundable for whatever reason you need to cancel if you cancel. That includes the death of a loved one, flight setbacks, water taxi setbacks and whatever other reason. 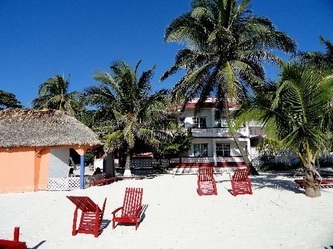 Ruby's Hotel offers the the budget-minded traveler the best in accomodations on Ambergris Caye. 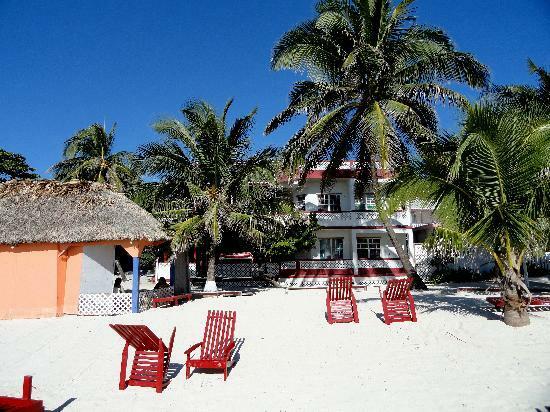 Ruby's Beachfront Hotel offers stunning views of the Belize Barrier Reef and is located right in the heart of town on Front Street for your convenience. Start your day with inspiring sunrises or relax and soak up some sun on Ruby's rooftop deck with a cold Belikin beer. Enjoy breakfast or lunch from Ruby's Cafe on the beachfront patio...a popular gathering spot for locals and tourists alike.